Rangers must make an audacious attempt to sign Aberdeen centre-forward Sam Cosgrove in the summer transfer window to add a proven source of Scottish Premiership goals to Steven Gerrard’s attacking arsenal. Cosgrove, 22, has been in sensational form at Pittodrie this season, as Rangers fans will surely know, with the ex-Wigan forward hitting 16 goals in 29 appearances across all competitions – two of which coming against the Gers earlier this month. According to news outlet HITC, scouts have been flocking to Pittodrie to watch Cosgrove in action of the past few weeks as clubs from the English Championship have started to become interested in the target man. Amid the speculation surrounding Cosgrove’s future, it would be a no-brainer for Gerrard and director of football Mark Allen to also jump aboard the hype train and take an interest in the striker of their own as Rangers could do with additions up front in the summer. Kyle Lafferty is in a similar-mould of player to Cosgrove, however the Gers forward is nine years older than the Dons goal machine and has really struggled for form this season. It would not be a bad idea to look at replacing the 31-year-old Northern Ireland international in the summer, and there is of course the chance that Bournemouth could recall Jermain Defoe from his loan spell at Ibrox while there is constant speculation surrounding Alfredo Morelos’ future in Govan. Ibrox would roar if Rangers were able to sign a young, prolific centre-forward in the summer, not only to reduce the average age of the squad but to add a different dimension to their attack. James Tavernier and Daniel Candeias know how to whip a ball into the box and while Morelos is lethal in the penalty area, he’s hardly someone who can out-jump some of Scotland’s burliest centre-halves. 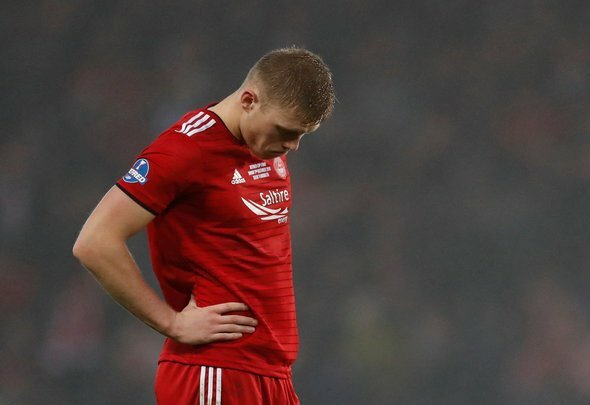 Cosgrove can be a game-changer at Ibrox in 2019/20 and Gerrard needs to ensure he can strike a deal for the in-form Aberdeen man.